Today my personal styling services for private individuals are being reviewed by Sylvia Van Driessche of Belgium’s national newspaper, Het Laatste Nieuws, reaching 1.7 million readers daily. 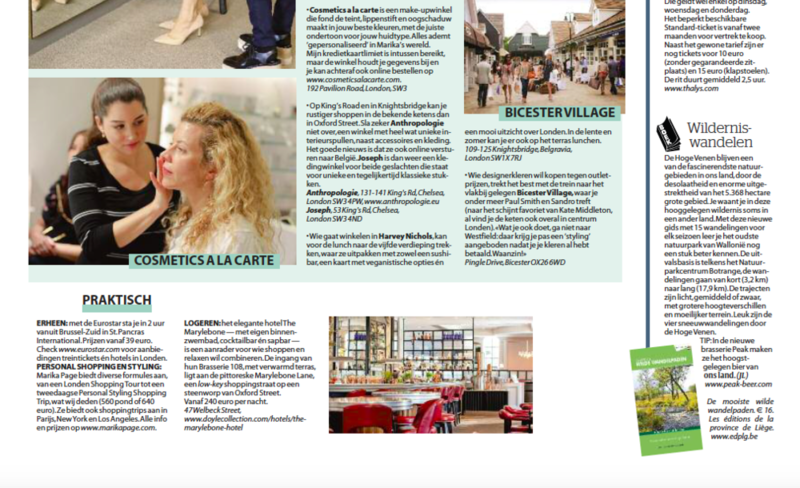 Thanks Sylvia for this wonderful coverage, and happy taking you on your ‘best styling day in London!’ (Thank you!). This stylist and personal shopper lives and works in London and has been bitten by the fashion bug. After a short career as a lawyer eight years ago she gave that up to study at the British College of Personal Styling. Since then she dresses both celebs on the covers of international magazines, fashion addicts, and people who have no clue about fashion. She attends fashion weeks in London, Milan, Paris and New York, and she shops on a professional basis daily. On her site www.marikapage.com she offers various styling packages from Personal Colour Analysis, Wardrobe Planning & Assessment, Body Analysis, to Personal Styling Shopping Trips and shopping tours through the city. I contacted her myself with the message that: 1) I’d like to find shops that suit me better . Read: I don’t want to shop in chains full of teenagers anymore. 2) I do not want to include expensive designer boutiques. Read: my budget is not infinite. When I meet Marika, she immediately made me feel like it’s her mission to style me over and let me shine. She is passionate about her styling and every tip is perfect for my body shape and style preferences. And her client focus goes beyond fashion. If she notices that I am interested in a certain members club, she even takes me there with her. Pure luxury! With this two-day Personal Styling Shopping Trip you only have to try on the clothes with Marika for one day, she uses the previous day to prepare all your clothing and style your outfits for you in advance. The cost - 560 pounds or 640 euro - seems high, but Marika tells me thanks to her knowledge I will save money in the future, because I will be able to style myself. People often copy influencers on social media, but influencers only know how to dress themselves. And the young personal shoppers connected to a brand or store have no specialist training. An independent personal shopper first studies the taste of her clients and looks at what colours give them the wow effect before going to shop for them. That client personalisation is a big advantage says Marika. Having said this, Marika leaves me to complete a questionnaire (What do you want to convey? Which iconic woman do you admire the most because of her style? ), after which she gives me a Personal Colour Analysis session. She tells me immediately that "something is not right". Gulp ...Luckily she is talking about my hair colour: all the 'gold' has to be removed, since I am better with pastel colours with cool undertones. Once she has determined my colours, Marika goes to work. She does the store preparation in the best shops for me. Even before we do the styling session, she’s been preparing for a whole day in advance so the shopping is focused. We agree to have a selection prepared in a private styling lounge that she has reserved in Harvey Nichols department store. While fitting I may drink what I want (including champagne!). Marika also helps me with some discounts - insert joyful dance! Throughout our day at Harvey Nichols Marika continues to repeat what I have to pay attention to regarding style, shape and color. The principles were re-iterated as we went along, so that I will never forget. And I must say: her reclaimed knowledge saves me today time and money during online shopping. That's how I learned what my wow colours are (powder blue, never thought! ), and that I should always have my sleeves three-quarters rolled up the arm. Since I'm petite cropped lengths suit me so that I am not swamped with fabric. Also important: I know which pieces to avoid from now on ('A pair of shiny leather pants as this gives too much volume in the curve'). I also employ Marika's trick that all celebs use: three photos of yourself - front, side, back - have it taken in the outfit you want to buy. The result is eye-opening, both in a positive and negative sense. Finally, a good tip is to take ready-to-wear clothing for alterations when petite sizing is not available in order to get the perfect fit. And my alterations were complimentary with my booking with Marika. Personalisation is everything! • Marika takes me to her favourite shopping area, Sloane Square. With it’s smaller boutiques it is a lot less crowded than central London. In an affordable store of which Marika suspects is up my alley, I am indeed enthusiastic. Intropia, I’m definitely coming back! 27A Sloane Square, Chelsea London, SW1W 8AB. • The Duke or Yorke Square, a shopping centre in a small square in Sloane Square, has several restaurants with terraces. Highly recommended for a lunch in the spring and summer. 80 Duke of York Square, Chelsea, London SW3 4LY. TRAVEL: with the Eurostar it’s 2 hours from Brussels South to St. Pancras International. Prices from 39 euros. Check www.eurostar.com for offers of train tickets and hotels in London. PERSONAL SHOPPING AND STYLING: Marika Page offers various packages, from a London Shopping Tour to one day Personal Styling Shopping Trip, which we did (£560 or 640 euro). She also offers shopping trips in Paris, New York and Los Angeles. All info and prices on www.marikapage.com.